Posted on October 18, 2018 at 7:09 pm. Paul Allen’s name is often associated with Bill Gates. They went to school together in Seattle in the 70’s and co-founded Microsoft. Allen has many interests. He founded the Allen Institute for Brain Science in 2003 to accelerate the understanding of the human brain in health and science. To date, he has donated $500 million to this project. Allen is also behind the redevelopment of the South Lake Union neighborhood in Seattle. Not long ago, the area was blanketed in old industrial buildings, many of which sat empty. 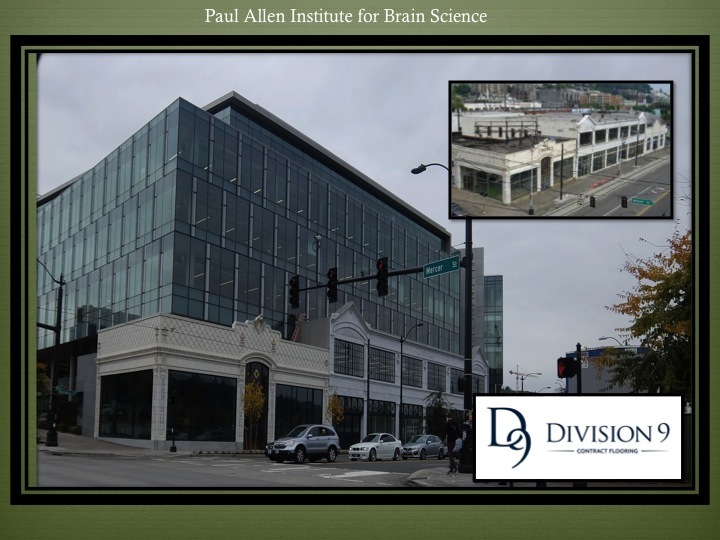 Allen is now moving his Institute for Brain Science to South Lake Union with a prime location on Mercer and Westlake Avenue North in Seattle. The new Institute for Brain Science will mix old and new. Ford and Pacific McKay auto showrooms once sat in the location. In an effort to retain some historic elements of the old building, Allen has used 2760 pieces of the original 1920’s terra cotta. Division 9 Flooring is extremely proud to be a part of such an important and impactful project. “I can share with you from my perspective, you guys did a great job! My attention turns to your scope when there’s a problem. Floor prep and moisture mitigation is always an issue. I felt you and your team really came to the table and worked with us to minimize this risk. That was a big plus. The other issue we had to address and needed your help with was helping P+W select the wood flooring. Again, a big plus to Div9 for being very patient and proactive in providing multiple solutions.